The three days of the World Kabbalah Conference in Vilnius, the capital of Lithuania, brought about a change in the hearts of hundreds of Europeans who came to experience what the wisdom of Kabbalah is about. The slogan of the conference “From Chaos to Harmony” said it all: in the face of the growing ego that separates us and creates a chaotic world, a method is needed to connect us and raise us above our ego, to build a network of positive connections and to discover the harmony that already exists between us. If we examine the general system, it is possible to see that there is completeness and order in its general laws. According to the wisdom of Kabbalah, we exist in an infinite world, in a steady, perfect, and orderly system; but in contrast to that, we are constantly subject to internal changes, and so it seems to us that the world is changing. Question: If we remove all of the lies from history, it will not mean that we will be left with the truth; in fact, we may end up with nothing at all. They say that history is written by the conquerors. Is that so? If we studied the history of those who were defeated, would it look completely different? Answer: The fact of the matter is that there is no history. There is a fixed state in the beginning of creation called Malchut of the world of infinity, which contains the initial substance of all of creation. All the worlds and everything inhabiting them exists in Malchut of the world of infinity. 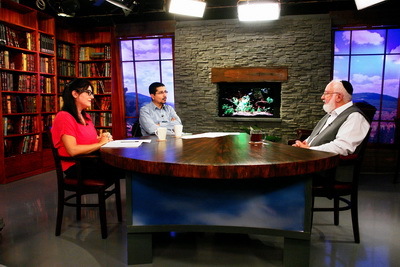 Kabbalah studies the four phases of the expansion of the direct Light. Everything starts with the Light or the Creator. The Light is called the Creator because it creates or begets. This physical substance it the quality of bestowal. The Light, expanding from above downward, builds a desire that matches it; this is the first phase. 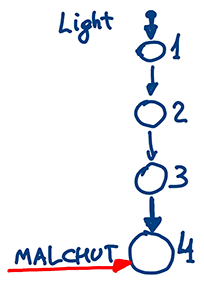 It then evolves into the second, then third, and finally, the fourth phase, called Malchut. This completes the expansion of the four phases of direct Light. All the rest takes place inside Malchut, which is an enormous will to receive. Malchut, perceiving itself distant from the Light and opposite to it, does not agree to remain in this state and performs a restriction. After that, it decides that it necessarily has to be equivalent to the Light, meaning to perform certain transactions with it. That is how it gradually grows closer to the Light. The most important thing about Malchut’s development is to build a state called “world” out of itself—and this does not mean our world, within which it builds creation, say, man. Let’s call him Adam. 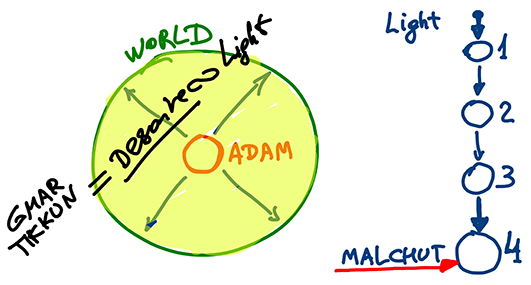 The problem that Malchut wants to solve is: How does it juxtapose Adam with the world in a way where his entire volume (the yellow in the image) will be filled by the upper Light? This is implemented by people who in our world try to become similar to the Light. They create a common desire that is similar to the Creator and reach the state of the full correction, called Gmar Tikkun. This comprises all of human history. Torah, Deuteronomy 33:01: And this is the blessing with which Moses, the man of God, blessed the children of Israel [just] before his death. There is no person more exalted throughout history or the spiritual planes than Moses. The blessing of the Creator always flows through him. And the Creator always communicates only through this level. It is written that Moses blessed the children of Israel before his death because that is where his function in relation to the lower levels or parts of the souls that he corrects is terminated. It no longer functions, which is called death. Question: What is so special about today’s ecological situation? What is the difference between an earthquake or volcanic eruption that occurs today and the ones that happened a thousand or two hundred years ago? Answer: The reason for these natural cataclysms is different. A thousand years ago, the cause of an earthquake was in the natural process of evolution that sought to advance us and for all of nature to balance. The cause came from the force of nature itself, and now the cause is in our own negligence. Instead of bringing all parts of nature to connection, a person causes universal separation. The world turns into a small village where everyone is connected with each other, and now we ourselves are responsible for maintaining the balance in nature. It turns out that each problem caused by a lack of balance points to our incorrect behavior. If previously hurricanes and earthquakes forced us to advance in developing technology and economy, today, they simply humble us. It is not enough to react to the blows of nature by the development of technology; today, social changes, and the correction of social connections are already necessary. If we do not react correctly, then we aggravate the situation. Torah, Deuteronomy 32:22: For a fire blazed in My wrath, and burned to the lowest depths. It consumed the land and its produce, setting aflame the foundations of mountains. Everything that a person does based on his egoistic ideal will perish in four kinds of executions. The Book of Zohar describes this in very unpleasant terms. It is written that a fire “consumed the land and its produce,” which means that eventually we will have nothing left. Now we think that the golden age is ahead of us, robots will work for us, and we will spend every day laying on the beach or partying and having fun. But this will not happen. On the contrary, people will suffer from deep depression, they will start consuming drugs and pills! They will hate themselves and the entire surrounding world; they will want to die, but will not be able to do so! Life will become worse than death. This indeed is a real hell. A person suffering from depression would be glad to die. But what can he do if he is unable to kill himself? His whole life is total misery. Question: What does it mean “Setting aflame the foundations of mountains”? Answer: “Mountain” is from the word “Hirhurim” (doubts) and means all sorts of internal disturbances. We will see that all of this comes from the Creator and we cannot escape from this, and all because we neglect His path and do not want to rise above our egoism to the realm of bestowal and love. Therefore, we will feel that He is against us in everything. We will not be able to live, and we will not be able to die, and we will suffer every second! This state will eventually bring people to correction, but by a very long and terrible way called the path of suffering.